ATLANTA (AP) — Georgia's timber industry is facing many headwinds as it seeks to recover from the severe damage wrought by Hurricane Michael late last year. PANAMA CITY, Fla. (AP) — Hospital administrators in Florida's Panhandle say baby deliveries cannot resume at their facility because of damage from Hurricane Michael. TALLAHASSEE, Fla. (AP) — Officials say 20 state correctional facilities across 15 counties suffered about $50 million in damage from Hurricane Michael. ORLANDO, Fla. (AP) — A new report shows how much Hurricane Michael has affected home sales in the area of the Florida Panhandle where it made landfall last October. The report by Florida Realtors shows that year-over-year sales of single-family homes declined by more than a third in the Panama City metro area during the last quarter of last year. Sales of townhouses and condos were down almost 30 percent in the last quarter. PANAMA CITY, Fla. (AP) — A utility company is asking a Florida regulatory agency to allow it to add an $8 a month surcharge for residential customers to make up the cost of restoring power and repairing the grid after Hurricane Michael devastated the Florida Panhandle. Gulf Power on Wednesday asked the Florida Public Service Commission to approve the plan and allow it to raise the rates of industrial and commercial customers by 3 to 8 percent. MEXICO BEACH, Fla. (AP) — The Woods had a rule for surviving hurricanes. RICHMOND, Va. (AP) — The U.S. Department of Agriculture has issued disaster designations for seven Virginia counties affected by extensive flooding and winds caused by Hurricane Michael in October 2018. The designations make farm operators eligible for consideration for assistance from the USDA's Farm Service Agency. The assistance includes FSA emergency loans. PANAMA CITY, Fla. (AP) — Florida Panhandle authorities say scam artists are targeting Hurricane Michael survivors looking for rental homes. In a statement Wednesday, the Bay County Sheriff's Office warned that several schemes are circulating in communities trying to recover from the October storm. PANAMA CITY, Fla. (AP) — A Florida Panhandle school district hit hard by Hurricane Michael stands to lose up to $51 million because so many students were displaced by the storm. MARIANNA, Fla. (AP) — Florida will get potentially hundreds of million dollars for Hurricane Michael recovery after President Donald Trump agreed to expand the number of days the federal government will reimburse state and local governments for cleanup efforts, the state's governor announced Thursday. TALLAHASSEE, Fla. (AP) — It could take a decade or more for Florida's timber industry to recover from Hurricane Michael's devastation, and the countless downed trees pose an immediate wildfire threat, Forida Forest Service Director Jim Karels told a Senate committee Tuesday. ST. PETERSBURG, Fla. (AP) — Florida park officials are still dealing with the damage caused by Hurricane Michael. PANAMA CITY, Fla. (AP) — Three months after Hurricane Michael devastated a large swath of Florida's Panhandle, inmates and staff members are finally returning to the Bay County Correctional and Rehabilitation Facility. PANAMA CITY BEACH, Fla. (AP) — A coastal engineering consultant says Panama City Beach suffered only moderate beach erosion during Hurricane Michael. On Tuesday, Lisa Armbruster told the Bay County Tourist Development Council that the 4½-foot (1.22-meter) storm surge during the Oct. 10 storm, the northerly winds on the western side pushed the water back out to sea. PANAMA CITY, Fla. (AP) — In the aftermath of Hurricane Michael, a Florida father and daughter wanted to spread some cheer so they spray painted smiley faces on dozens tree stumps that had snapped in the devastating storm. Tim west and his 13-year-old daughter were bringing food and supplies to a friend in the Panhandle last fall when they saw the tree stumps and decided on a whim to paint them. MEXICO BEACH, Fla. (AP) — Saralyn Harder's short commute to a temporary job in a barbecue food truck at the edge of town winds through a paradise violently deconstructed. The palm trees, blanched by salt water, have turned brown and yellow. Dirty sand covers the sidewalks, with treadmarks carved by bulldozers and dump trucks. 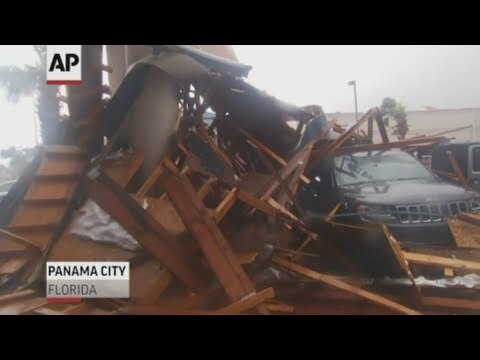 PANAMA CITY, Fla. (AP) — A flood of 911 calls hit emergency operators in Florida's Panhandle as Hurricane Michael roared ashore. BRISTOL, Fla. (AP) — Strewn in gnarled piles from Florida's Gulf Coast up through South Georgia, the livelihood of timber farmers is on the ground. And, after the ravaging buzz saw of Hurricane Michael in early October, it will be a while until they begin to bounce back to prominence. Michael's path carved though a part of the state where Floridians are most reliant on timber. More than 2.8 million acres of timber were damaged by Michael's powerful 155 mph winds. AUGUSTA, Ga. (AP) — Some Georgia farmers are eligible for federal loans to help cover the costs of losses sustained because of Hurricane Michael. The Augusta Chronicle reported Tuesday that Agriculture Secretary Sonny Perdue designated several Georgia counties as primary natural disaster areas, allowing the U.S. Department of Agriculture to offer the loans. PANAMA CITY, Fla. (AP) — Officials in Florida's Panhandle have agreed to take out a $50 million loan to help pay for Hurricane Michael-related bills until federal reimbursements are received. The Panama City Commission approved the measure Monday, calling the loan a "necessary evil." TALLAHASSEE, Fla. (AP) — A top official in Florida's highway agency and her deputy resigned after an investigation into whether state employees were sent to the official's south Georgia home to clean up fallen tree limbs and connect a generator after Hurricane Michael. Kelley Scott, director of administrative services for the Florida highway agency, and Shane Phillips, the agency's chief of office services, submitted their resignations Monday — departures that become effective next month. PANAMA CITY, Fla. (AP) — Officials want to shut down a tent camp where hundreds of people have stayed since Hurricane Michael struck Florida's Panhandle in October. MEXICO BEACH, Fla. (AP) — Rebuilding is a slow process in a Florida Panhandle beach town devastated by Hurricane Michael, officials say. The hurricane made landfall Oct. 10 near Mexico Beach with 155 mph (250 kph) winds and a strong storm surge. Essential services, including power and water, have been restored, and some local businesses have reopened. PANAMA CITY, Fla. (AP) — An Air Force base that is recovering from the devastation of Hurricane Michael could be getting 72 new fighter planes. The Panama City News Herald reports that three squadrons of F-35 fighter jets are expected to come to Tyndall Air Force Base by 2023. Each squadron has 24 planes. PANAMA CITY, Fla. (AP) — When Hurricane Michael tore through the Florida Panhandle, it uprooted countless trees. Now, Panama City officials say they're committed to planning 100,000 trees by 2025 to replace them. Joe Littleton, president of Landscapes Inc., tells the News Herald he lost "every single tree" in his yard to the Oct. 10 hurricane and plans to donate four trees as a symbolic gesture. PANAMA CITY, Fla. (AP) — A hospital on Florida's Panhandle says it will lay off 800 employees — nearly half its staff — because it suffered such serious damage from Hurricane Michael. Bay Medical Sacred Heart said it will make the cuts Feb. 4 after it reopens in January at one-fourth its previous size.